Hey there, Im 18 years old and currently a 8k on KGS. I started playing in november 2003 and took a three months break in the fall of 2004. I live in NYC and was part of Stuyvesant HS GO club. I will be attending Binghamton University and will also be an active part of their GO club. Although I am pretty weak, I think I can help 18k+ on their games. If you are a beginner, you can find me at rooms->social->metropolitan GO alliance and Ill gladly share my limited knowledge of GO with you. lloyd <- very helpful and patient person. antimatter <- member of HS GO club, helped me with my earlier games. 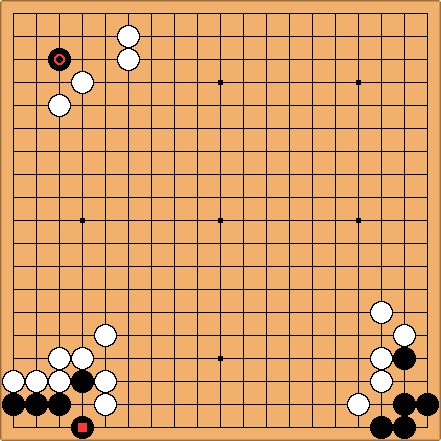 qian's weekly "get strong in GO"
to win games, you need to 'get strong' in invasions >:) instead of playing sente life on the square. One should always grab invasion opportunities, as shown by the circled move.